Experience a unique quad bike tour from Nomad Safaris, the professional adventurers. Nomad Quad Safaris operate fully automatic 400cc Honda quad bikes with 4WD ensuring an experience that is adventurous yet safe. Full training on the quad bike ensures that all levels are catered for. All weather waterproof clothing is also provided along with all safety gear in order to ensure a fun yet safe quad bike tour. Nomad Safaris has exclusive use of Queenstown Hill ensuring that on your Quad Bike tour you get breathtaking panoramic views that are exclusively yours. Don’t forget your camera as the viewpoints provide stunning photo opportunities. 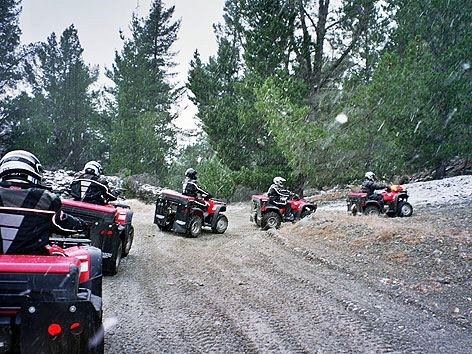 As Nomad Safaris has exclusive use of Queenstown Hill this ensures access to a wealth of trails covering different types of terrain allowing a Quad Bike tour that is tailored to the ability of the group. 3.5 hours in duration including transfers and training and all riders must be over 16 with a Drivers Licence.